Call of Duty: Modern Warfare 2 isn't just the biggest video game launch in history, it's the biggest launch across all forms of entertainment, beating out the likes of Harry Potter books, The Dark Knight and band 'N Sync. But at least one other military video game has their sights set on the popular first-person shooter, getting a bit of added traction thanks to some controversial design decisions made in the Activision blockbuster. For the uninitiated, Electronic Arts' upcoming first-person shooter Battlefield: Bad Company 2 may sound an awful lot like Modern Warfare 2. Both military games are set in modern times and pride themselves on realistic settings, weapons and combat. But where Modern Warfare 2's single player story is a narrative that leads players through the action along a scripted plot, Bad Company 2's developers say their game is a more open-ended experience. "Battlefield: Bad Company 2 delivers an all-out war experience unlike any other FPS with its wide, open sand box environments, tactical destruction and of course the full range of player controlled vehicles," said Karl Magnus Troedsson, the executive producer of the Battlefield Franchise at Digital Illusions CE. "The game stands on more legs than this but these are the key areas which elevate Battlefield: Bad Company 2 above the rest of the pack." While Troedsson calls Modern Warfare 2 and Bad Company 2 direct competitors, he knew better than to launch EA's up-and-coming shooter at the same time as titan Modern Warfare 2. Instead, Bad Company 2 will be hitting the PC, Playstation 3 and Xbox 360 about four months later, in early March. "These games are direct competitors while still being different games with different experiences," Troedsson said. "The gamers who like one will probably like the other, at least if they could get into the groove of the different second-to-second experiences. "Obviously I wouldn't want to launch at the same time (as Modern Warfare 2). However, we've seen a huge uptake in interest for Battlefield: Bad Company 2 even during the height of their marketing campaign. And we're just getting started." 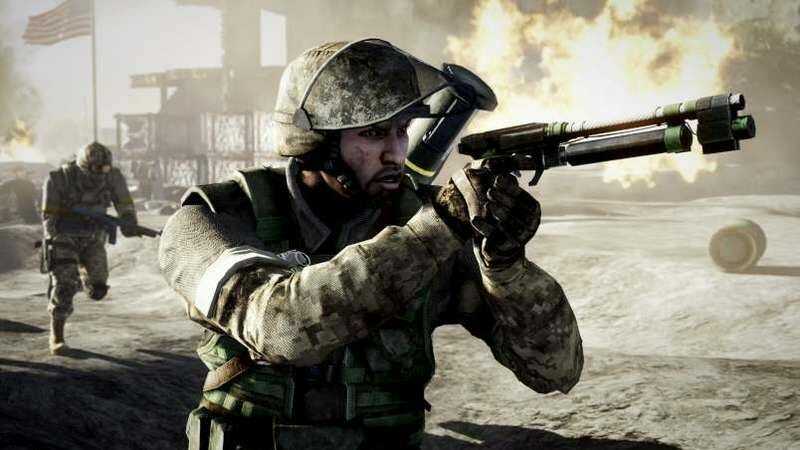 Much of that increased interest in Bad Company 2 has been driven by gamers unhappy with some of the decisions made in the development of Modern Warfare 2. Most contentious among gamers was developer Infinity Ward's decision to limit the control PC gamers have over how they play Modern Warfare 2 online. Shortly after news broke that Modern Warfare 2 wouldn't support the ability for gamers to run their own online games on dedicated servers, Digital Illusions CE announced that Bad Company 2 would have dedicated servers. It may sound like a small issue, but the Infinity Ward's decision spurred an online petition that currently has more than 210,000 signatures. It also created a movement among some gamers to shift their game purchase from Modern Warfare 2 to Bad Company 2. One gamer mailed a check to Digital Illusions CE, telling them to use the money he had earmarked for Modern Warfare 2 to improve Bad Company 2. Troedsson wouldn't say how big a factor dedicated servers will be for gamers come March. "I can't answer since it's up to the audience," he said. "What I can say is that we've always considered this a key factor to deliver the best online experience available and anyone caring equally much about this will probably get more out of the multiplayer experience in Battlefield: Bad Company 2." And he notes that while there are plenty of vocal gamers currently pledging support for Bad Company 2 at the cost of Modern Warfare 2, it's still a small percentage of the entire audience. "So far we've gotten a lot of positive feedback based upon what we've announced regarding Battlefield: Bad Company 2," he said. "Some of it has come in the form of proper fan dedication from new as well as old diehard fans. We greatly appreciate this. These are the people that are at the core of our audience, the players we often listen to and who can help shape our games into something even better. "However, comparing to the vast number of people that will buy the game it's still a small percentage of people that actually get in direct contact with us. As for the fan mail, what we've gotten recently I can only hope is a sign that we're doing something right." And there's always a chance that a fan base so fickle, so easily swayed by design decisions, could decide that something about Bad Company 2 isn't a good fit either. Troedsson realizes the risk of winning over such die hard fans, gamers who could be intolerant of change. "We can't fulfill everyone's wishes but we always build games that we truly believe our players will love to play," he said. With Bad Company 2 that means new game modes, new weapons and a much higher level of polish. Improvements that Troedsson believes makes Bad Company 2 the better of the two games. "Well, obviously I believe Battlefield: Bad Company 2 is better, especially looking at how our game incorporates an all-out war experience with vehicles, destruction, etc," he said. "But not without a large amount of respect for our competitor, they have a great product with a huge fan base. Don't expect us to be intimidated by sheer volume of sales though." In the first 24 hours alone, Modern Warfare 2 pulled in an estimated $310 million in North America and the United Kingdom alone, selling 4.7 million copies. "No matter what market or what products I'm a strong believer that there's always space for competition," Troedsson said. "It helps keep people on their toes and it helps drive development."